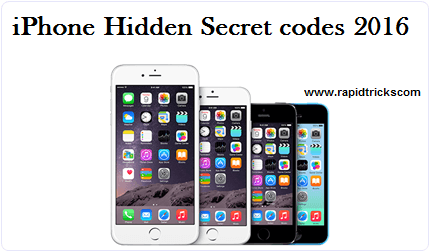 Hi, today in this article i will tell you “iPhone best hidden secret codes 2016“, these all codes are very useful and very informative for a tech lover person. So let’s see the best secret codes of 2016. The hidden secret codes are very useful to know information about your phone by just typing some short codes into it. These short codes allow users to check the phone’s status shortly without going into settings or anywhere in the iphones. Users just need to enter these hidden secret codes and iPhone will show the different settings according to the hidden secret codes which you have typed on the dial pad. The hidden codes we are going to tell you in this article are works for all iphones including iPhone 3Gs. These codes will help you to see the IMEI number, WiFi status, sensor settings and much more. So now let’s have a look on the hidden secret codes for iphones. You can apply these codes by just typing them on dial pad, use these codes carefully because they also can change your phone’s settings by applying them. Here is the list of best hidden iPhone secret codes of 2016, we will tell you the functionality for every code. By typing the above given code in your iPhone your iPhone will show the IMEI number of itself. You can dial the number to check the call forwarding status when the iPhone is busy. It will you the available minutes on your number. This code will show you the iPhone’s internal settings like newest network and cell information. This code will show your number’s current bill balance. This code will show you the prepaid account balance and this code is for prepaid customers only. The code will show you whether the call barring is enable or disable for outgoing calls also you can check all the usual things like SMS, voice information fax etc. By using the above code you can set inquiry for call forwards, and settings for call forwarding. You can also see whether you have knowledge sync, fax, voice, paid access and packet access call forwarding enabled or disabled. It will tell you about the use of information in your iPhone. You can use this code to check connected line presentation is enabled or not. While you are connected to a line using iPhone that time you can check whether the presentation is enabled or not. The code will you the number of missed calls. By using this code you can verify the number for call forwarding if these is no service available. Barring code, outgoing call abroad. This code will allow you to hide your number. The code will deactivate the waiting. Use this code to activate waiting on your number. The code will show you the call waiting status. To check the SMS center. This code will enable EFR(enhanced full rate) to improve your phone’s voice quality, but it will reduce the battery life of your iPhone. These above given codes are New iPhone best hidden secret codes 2016, these all codes are works perfectly for all the iphones. If you are facing any problem in using these codes than feel free to tell us in comment box. The latest article of 2017 is here for Iphone’s Top secret codes and hacks.